The hour is later than you think. Sauron’s forces are already moving. The Nine crossed the river Isen on Midsummer’s eve, disguised as riders in black…..
Wow, so I finally missed a blog post. As I’ve said the hour got later than I thought and I was beat. Hey, it was rough last weekend. I apologize. I should have put a one liner in or something. You know just so I could say I never missed a week. That sort of thing. But I digress. So what’s going on Jim? Okay so we’re not going to get into a bunch of excuses because I really don’t even remember what happened last weekend and why I didn’t post. Needless to say we are moving in the right direction and we’re starting to make some serious progress. Last weekend Terence and I started the curbs for the stone veneer. Kind of tricky stuff but the detail I came up with is a really good one I think. So the hour really is getting late and the United States Women’s soccer team is playing Japan for the World cup. It’s 6:19. Hmmm. Not a lot of time. I’m really jumping around here. Gotta regain my focus. So I think the best thing to do right now is plow right through this. Like I was saying last weekend Terence and I put the forms up for the stone veneer. Lets check out a picture or two shall we? A pictures a thousand words right so that’s the direction we’ll head in for now. Beginings of an outside curb. So what are we looking at here people? 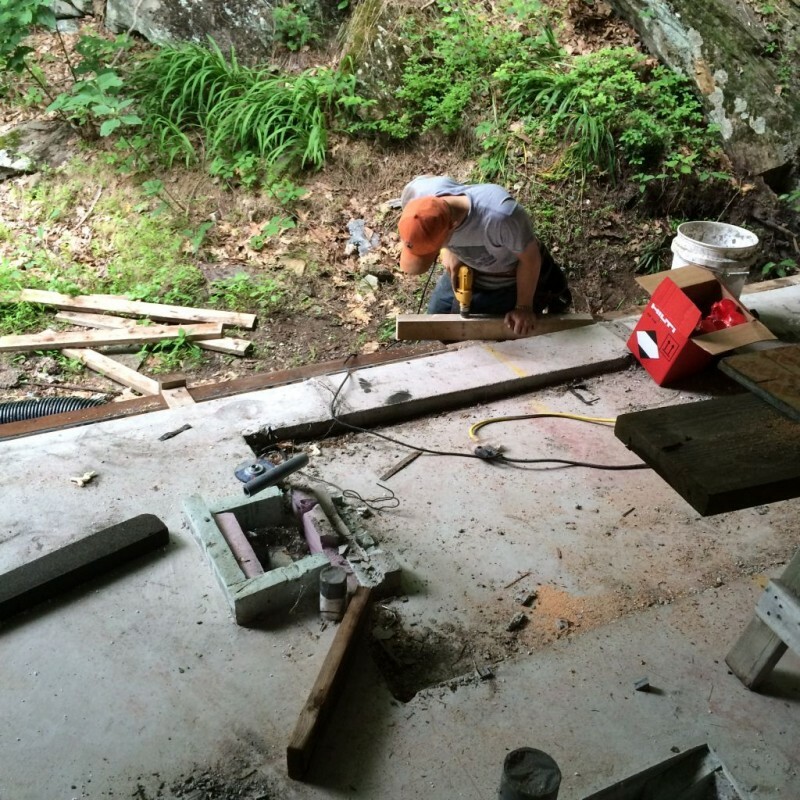 What we are doing here is creating a concrete shelf to sit stone on for the front of the Hobbit house. 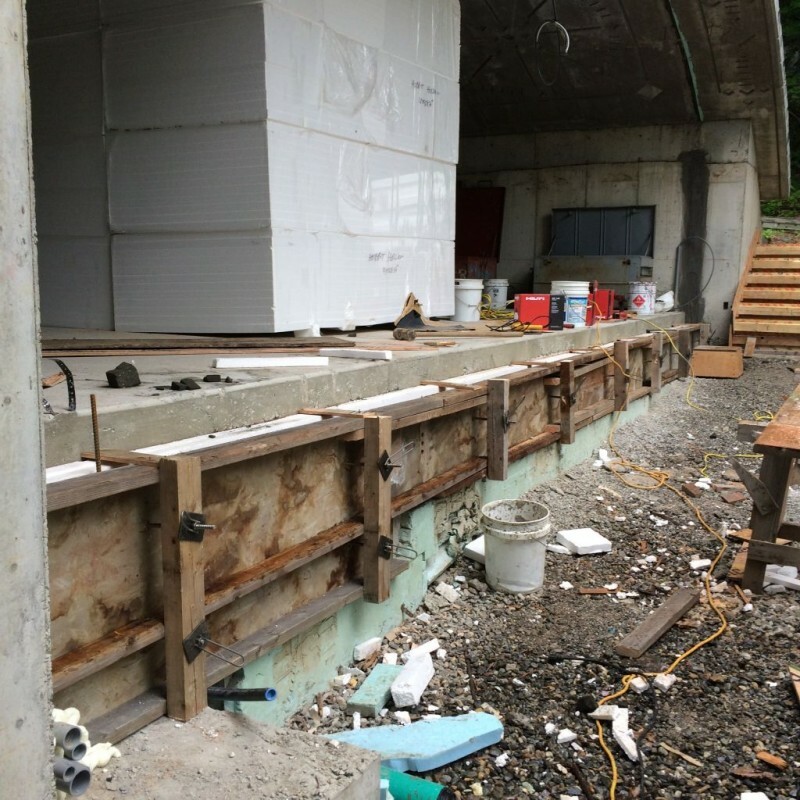 We epoxied threaded rods into the existing wall and are using foam glass insulation as a spreader on the bottom. Hmmm. Let’s back up. 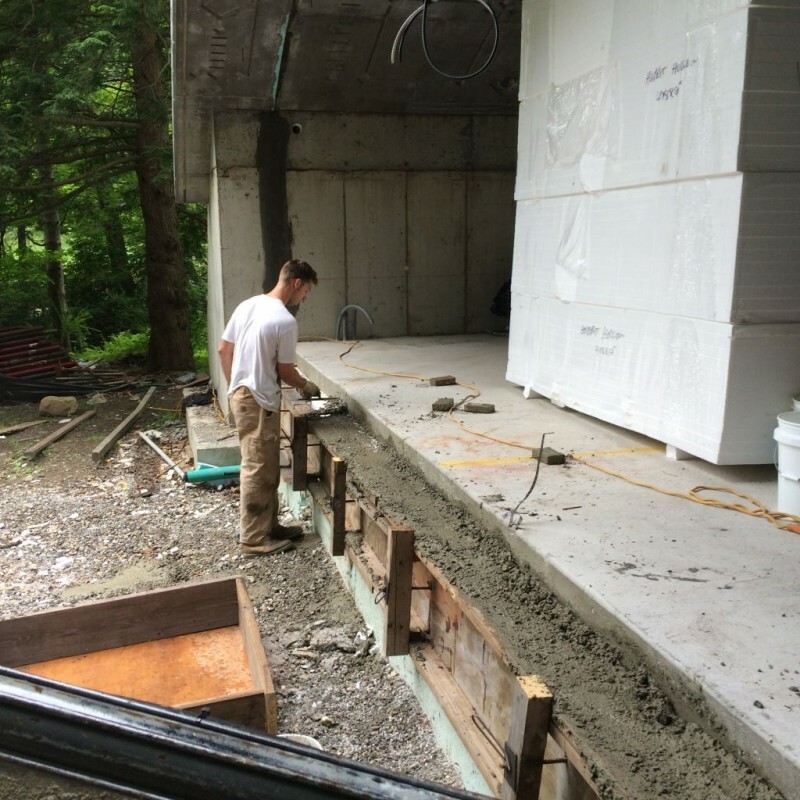 Against the foundation wall we put 4 inches of styrofoam insulation as our thermal barrier. 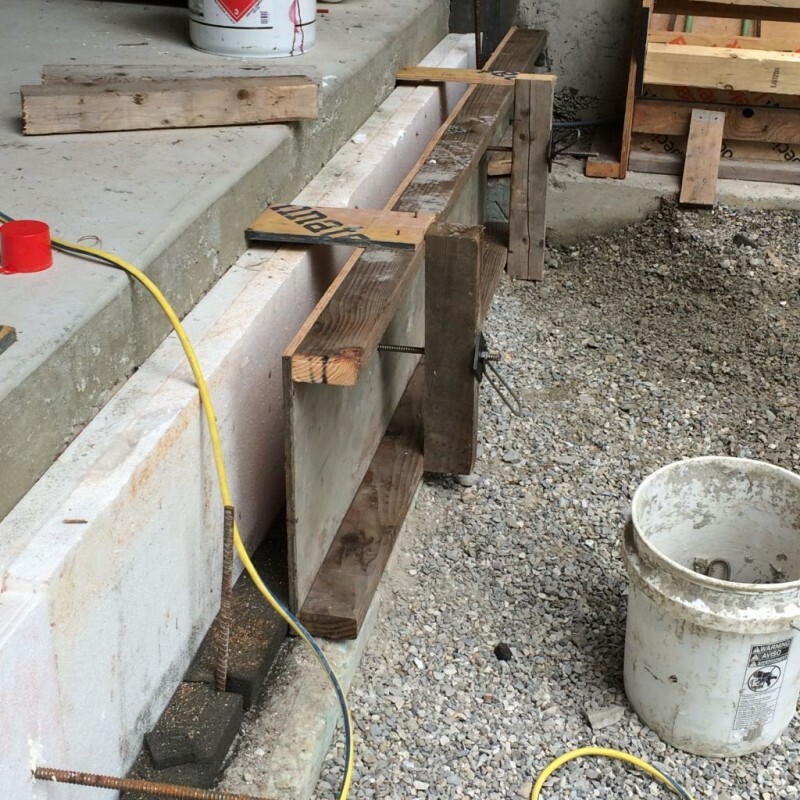 This is a Passive house so this is a critical detail. We’re using the black foam glass insulation on the bottom because it is vermin resistant as well as termite and ant resistant. Gotta keep those vermins out. It’s not part of Passive house but it’s a good selling feature nonetheless. So as you crank on the wing nuts for the threaded rods the form tightens up on the foam glass and the plywood at the top of the form. 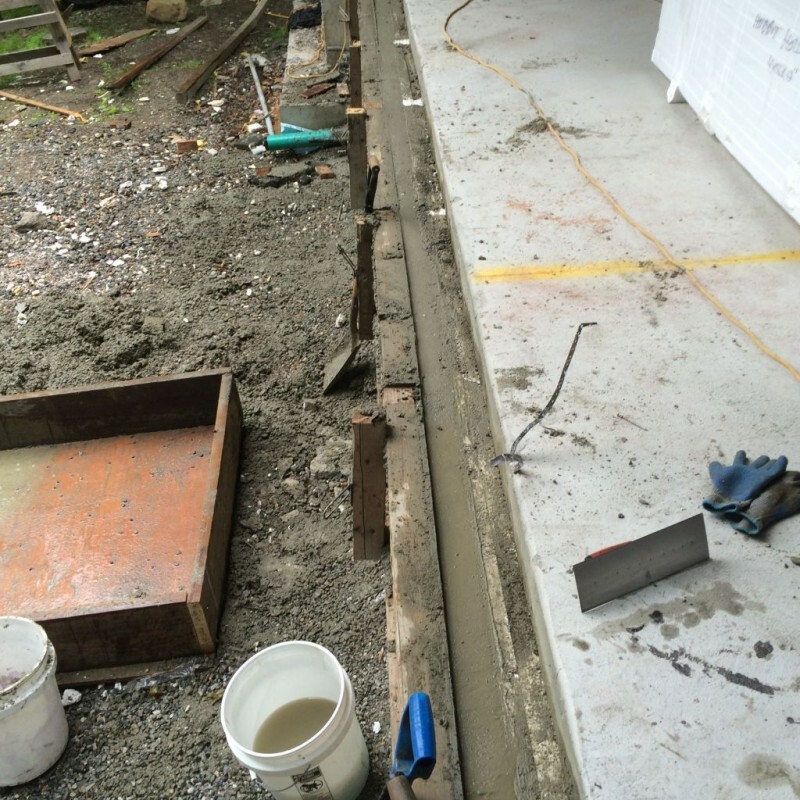 Once the plywood touches the concrete your done and ready for concrete. That’s the general idea here. Terence working on the curbs. Here’s a shot of the forms before the pour. Southside curbs ready for concrete. 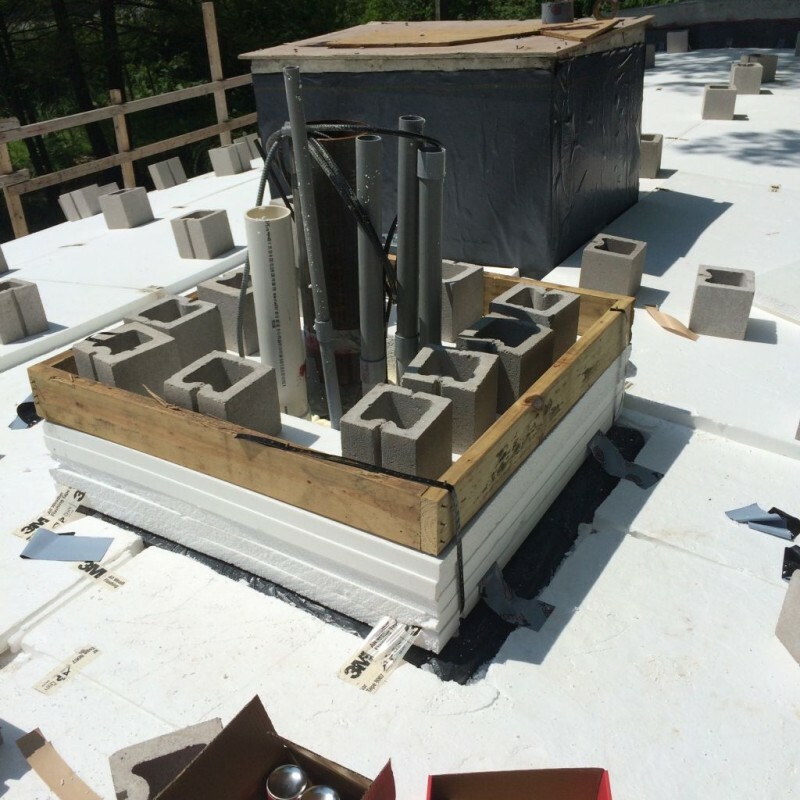 So during the week Terence and Jude worked on the roof insulation and finished up the balance of the curbs. Friday I had off so I was able to work on the chimney detail. So the whole idea behind the chimney is to get all the mechanicals through this one area and make it look like a working chimney. The critcal part here is to make sure no water can get inside the house at this location. So I came up with a plan. First part of the plan is to use the Sika 123 to pitch the grade away from all the pipes that are coming through the roof. Like so. Pitch concrete away from the pipes so it sheds water. I added some rebar in there to support the big pipe. Just so I could sleep better at night. 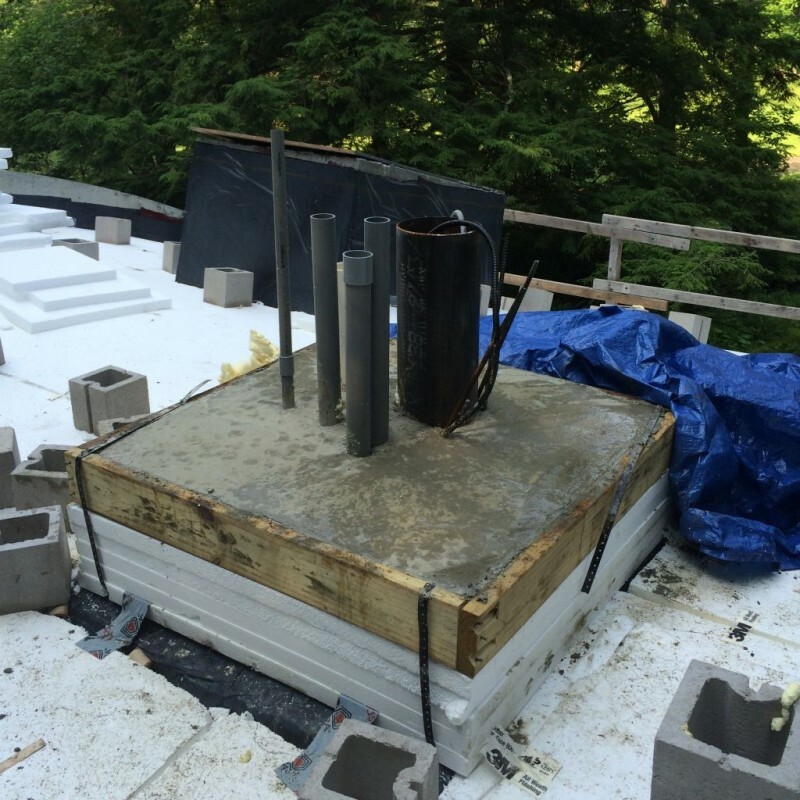 Then what I did was insulate around the pipes and put a 6 inch concrete form on top of it. This is going to be the base for the chimney later on. I called Bulldog Concrete up to see if I could get concrete for Saturday. Bulldog never says no. So he was able to come Saturday morning at 10 am. Terence and Jude had a previous engagement but Ethan and his friend Egzon were available so we made a go of it. 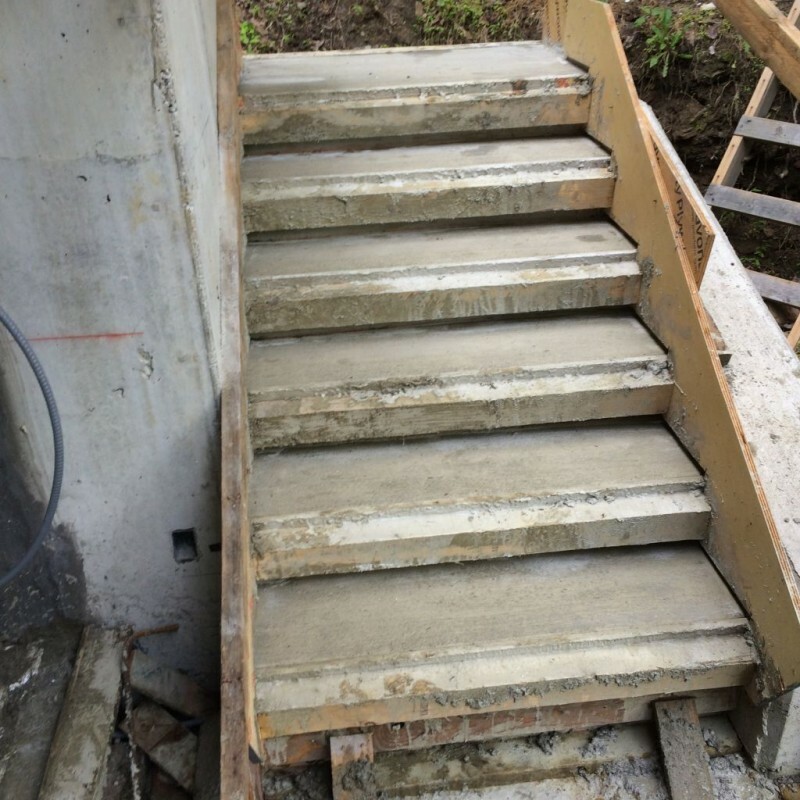 We poured the stairs the curbs and the chimney base. Bulldog was supposed to show up at 9 so we were able to get some cleanup done before he got there. 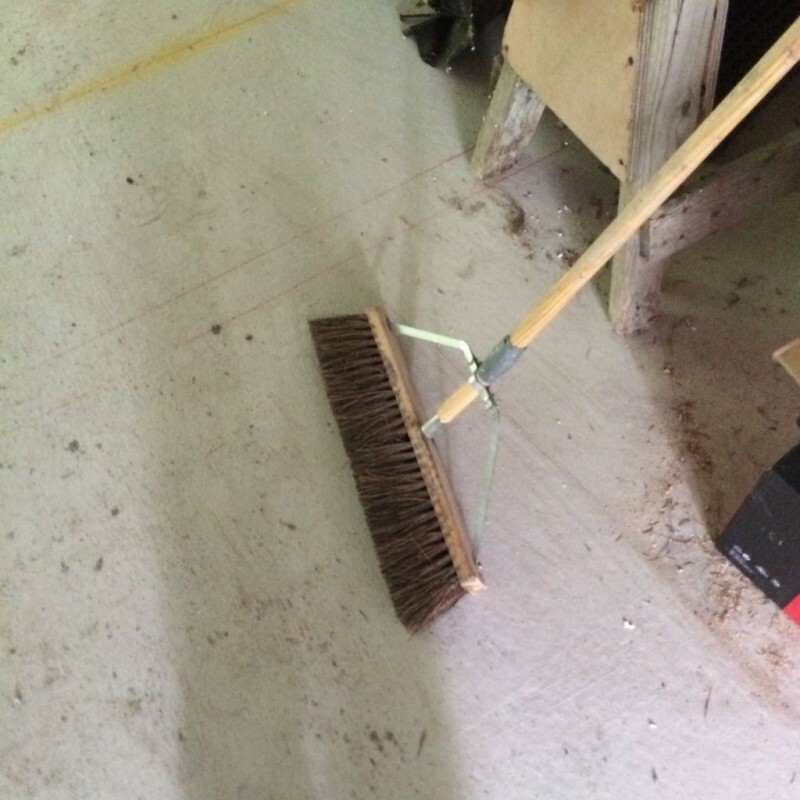 Of course Egzon broke another push broom with a stabilizer on it. That’s almost like getting struck by lightning twice on the same day. They thought I didn’t know about it. Look how they tried to fix the broom. Pathetic. Another broom bites the dust! Here are a few pictures of the pour. Ethan troweling the South curb. 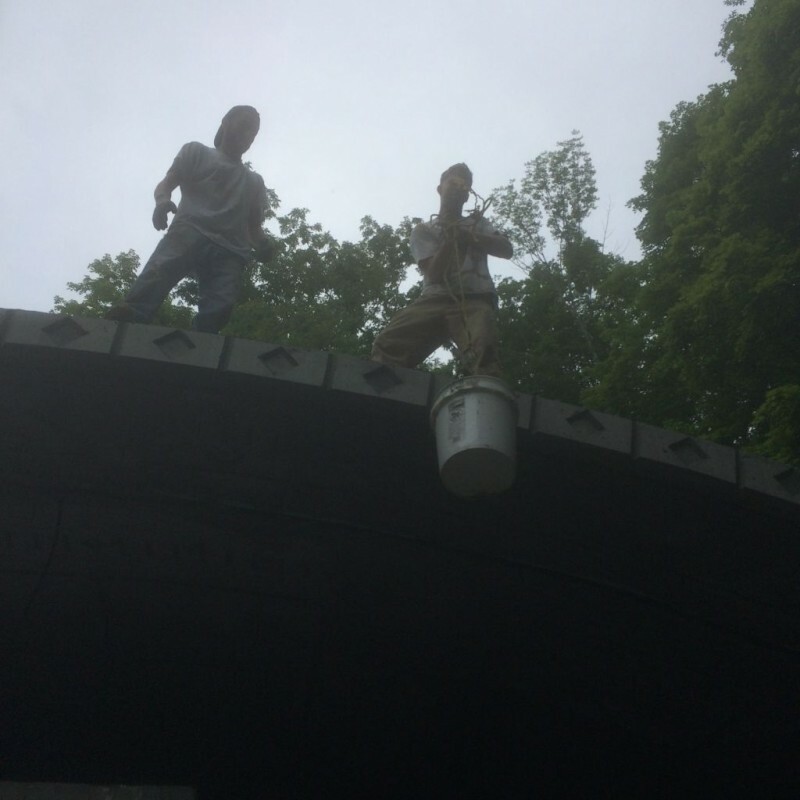 We used buckets to fill the chimney base. This is how the Romans built the aqueducts. A bucket a rope and 2000 slaves. 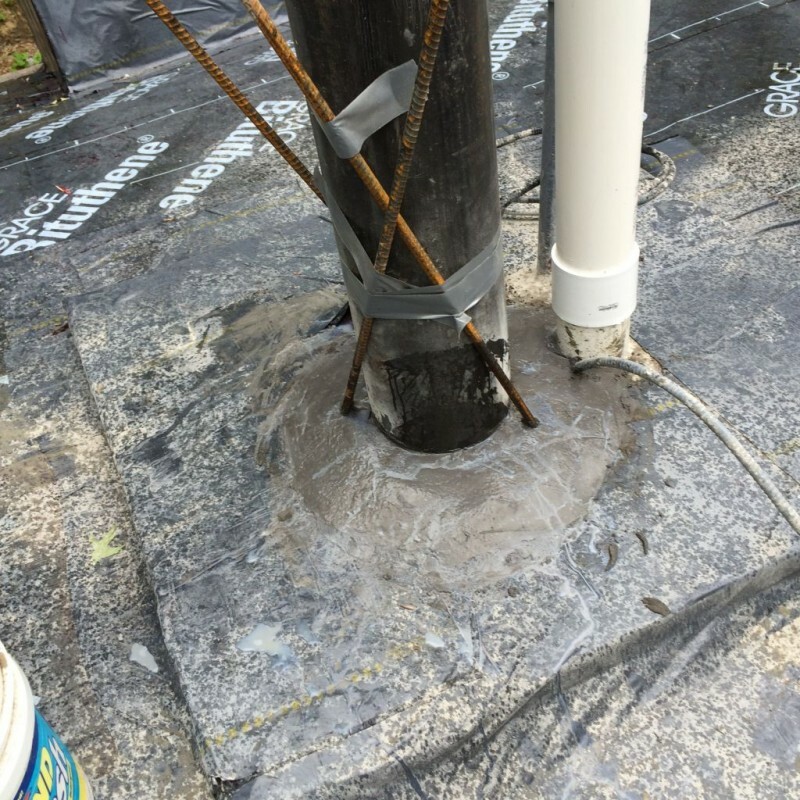 Chimney base poured with pitch. Oh yeah so we had a July 4th barbeque on the 5th. (Nicer of the two days.) Guess who shows up. Bob….and he wants to do the cooking! He doesn’t want to do the cooking he insists on doing the cooking! Okay I’m not into arguing with this guy but I told him I do not want anything raw. I ask the guy has he ever cooked a steak before and he says something to the effect that they’re really not to into grilling back where he comes from. Well that’s great. So then that battle ax of a Mother in law of mine says she’ll look after him while he’s cooking. Praise God! I got rid of two birds with one stone. 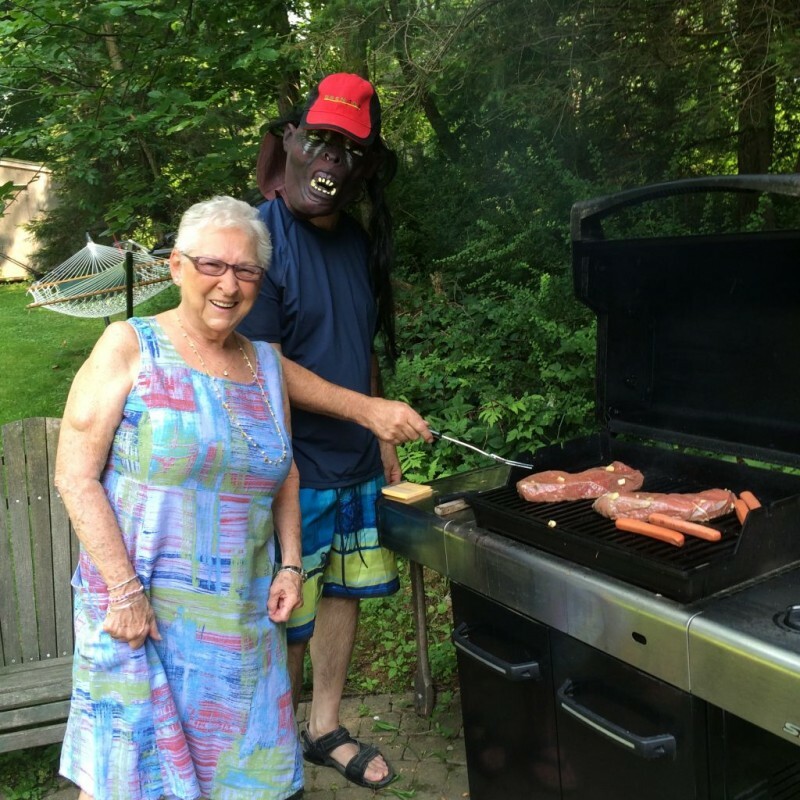 Check these two out at the grill. Look at these two! What a team! The hour is late and I have to watch my soccer. Enjoy your week!